The Paul Usoro that I know is not a greenhorn as far as leadership position is concerned. As an undergraduate in then University of Ife, Paul displayed exemplary leadership qualities as the President of the Law Students Society. When there was allegation of examination leakages in the famous institution, it was Paul Usoro’s petition as the leader of law students that led to the setting up of Adegbola Commission. And of course, Paul was the first witness to testify. If you have not, please go and read the case of Akintemi v. Onwumechile (1985) 1 NWLR [Pt. 1] for the full facts of the incident. By the way, that’s the first volume of Gani Fawehinmi’s Nigeria Weekly Law Report. That’s Paul Usoro for you. Bold, fearless and courageous. That’s the type of leader the Bar deserves at this time. Leaders in the mould of Jubril Martin, the first president of the Nigerian Bar Association. Leaders like Chief FRA Williams, who had the longest tenure from 1959 to 1968. Leaders like the legendary Alao Aka-Bashorun. We need leaders who will speak for what is right, and who will use their voices to defend the Bar, promote excellence and champion the best traditions of the bar. 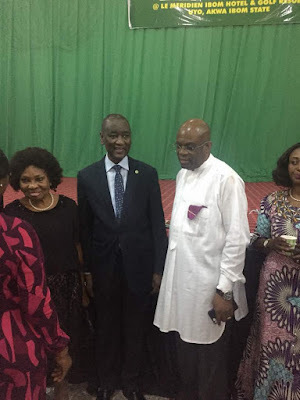 Let’s talk about Paul Usoro, the detribalized Nigerian. Ever since he set up his Paul Usoro and Company in mid-eighties, the firm has remained an equal opportunity training platform for all Nigerians irrespective of tribe or religion. You don’t need to bring a letter from a Judge or a politician for you to be employed in the firm. Notable alumni of the firm include Abdullahi al-Ilory, the scion of Sheikh Adam Al-Ilory of Markaz; Otunba Tokunbo Wahab who was a onetime gubernatorial candidate in Lagos State; and Ms. Bola Akande who has carved a niche for herself with Lotus Capital, to mention but a few. You may not know this, but the Head of Chamber of Paul Usoro & Co for many years is a Yoruba man. Alhaji Munirudeen Liadi, a devout Muslim, who is a partner in the firm has been the HOC for as long as I remember. That’s Paul Usoro for you. Is there any need for me to talk about his professionalism and competence? Paul is regarded as the foremost expert in communication law in Nigeria. Before telecommunication became what it is today, Paul has distinguished himself as an authority in the field. Not only that, Paul has successfully trained generations of lawyers who have gone on to excel in their various fields. One quality that I admire about Paul Usoro is his resilience. In mid-2000s, the Bank of Industry Building on Broad Street which housed Paul Usoro and Company went up in flames. The gigantic edifice came crashing down with the chambers that Paul Usoro had spent decades building. That singular incident was enough to kill the spirit of an average man. But not Paul. Like Phoenix – the legendary bird which rises from its ashes with renewed vigour – Paul Usoro rolled up his sleeves and started all over again. That’s Paul, the man with the indomitable spirit. When Prof. William Henderson, the director of the Center for Global Legal Profession said that: “the golden era [of legal profession] is gone, but this is not because the law itself is becoming less relevant. Rather, the sea change reflects an urgent need for better and cheaper legal services that can keep pace with the demands of a rapidly globalizing world” he could have been talking about the challenges confronting the Nigerian Bar. It is in order to ensure that the Bar that we all belong to is not left behind in the global scheme of things that I support the candidature of Paul Usoro. There are many challenges facing the Bar, both from within and from without. Young lawyers need to be assisted to gain foothold in the profession. Old wigs need to be provided with platform to keep abreast of changes in the profession. The golden era of the Bar must be brought back. Paul Usoro, Senior Advocate of Nigeria is the best man for this task. Onigegewura is my name and I am voting Paul Usoro for NBA President.